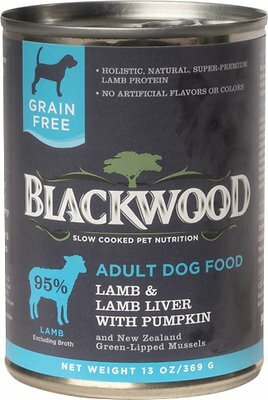 Nourish your best friend with the complete and balanced nutrition of Lamb, Lamb Liver & Pumpkin canned dog food from Blackwood. It features slow-cooked lamb as the first ingredient, followed by lamb broth and lamb liver. This ensures your dog gets a protein-packed meal that works to maintain his lean muscles. Next on the list, you'll find pumpkin—which is so much more than a basic fall staple. A reliable source of antioxidants, essential vitamins, minerals and fiber, that orange veggie supports your furbaby's healthy digestion. Added New Zealand green-lipped mussel also enhances digestion, and contributes essential vitamins, too! These wholesome, holistic ingredients come together to create an easy-to-digest meal sure to please your BFF's taste buds and tummy. For your peace of mind, it's also made right here in the USA, without the use of artificial flavors or colors. This grain-free, slow-cooked recipe features real lamb to support your dog's lean muscle mass. Contains pumpkin, which is a yummy source of fiber that encourages healthy digestion. Includes essential antioxidants, vitamins and minerals that promote his overall health and well-being. Also features green-lipped mussels to enhance your canine's nutrition and digestion. Proudly made in the USA without the use of artificial flavors or colors. Lamb, Lamb Broth, Lamb Liver, Pumpkin, Peas, Agar-Agar, Carrots, Calcium Carbonate, Tricalcium Phosphate, Potassium Chloride, Salt, Choline Chloride, Salmon Oil, Dandelion Greens, Dicalcium Phosphate, Dried New Zealand Green-Lipped Mussels, Sunflower Oil, Iron Proteinate, Zinc Proteinate, Manganese Proteinate, Copper Proteinate, Magnesium Proteinate, Sodium Selenite, Calcium Iodate, Vitamin E Supplement, Thiamine Mononitrate, Niacin Supplement, Calcium Pantothenate, Biotin, Vitamin A Supplement, Riboflavin Supplement, Vitamin D3 Supplement, Vitamin B12 Supplement, Pyridoxine Hydrochloride, Folic Acid. Adjust the amount of food you serve based on the age, size and activity level of your dog. Food should be fed at room temperature. Promptly refrigerate the unused portion. Adult Feed ¾ to 1¼ cans per 15 lbs. of body weight per day. Puppy Feed up to twice the adult amount per day. Gestation & Lactation Feed up to three times the adult amount per day. For combintion feeding feed ⅓ cup less dry food for every ½ can of wet food. Begin the transition by mixing both the current food with their new food together. Gradually decrease the amount of current food while increasing the amount of new food. Continue to do this over a 7-day period. Transitioning slowly can result in fewer digestive issues and better acceptance of the new food.